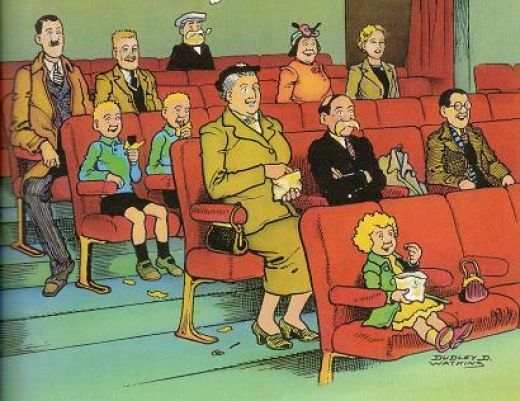 The Broons is a comic strip which appears every week in The Sunday Post, a newspaper which is published by D.C Thomson & Co. The strip was created by cartoonist Dudley D. Watkins, and first appeared on 8 March 1936. 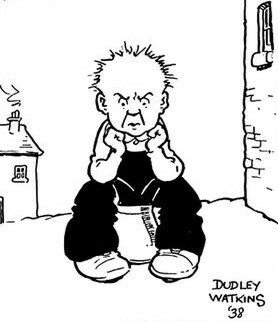 Watkins continued to draw Oor Wullie until his death, after which the Post recycled his work into the 1970s. New strips were eventually commissioned fromKen H. Harrison who was followed in 1997 by Peter Davidson, who continues to draw the strip as of 2008. Wullie's adventures consist mostly of unrealistic get-rich-quick schemes that lead to mischief, to the despair of his parents Ma and Pa (Dave), and the local policeman, P.C. Joe Murdoch. Wullie's friends are Fat Boab, Wee Eck, and Soapy Soutar, and he is the leader of their gang, a position which is frequently disputed by the others. He used to have another friend called Ezzy, who stopped appearing in the strips, along with Wullie's little brother. He owns a pet mouse named Jeemy, and in later years has gained a Highland Terrier named Harry, and a "sometime-girlfriend", Primrose Patterson. Characters from The Broons occasionally feature, particularly Granpaw. Wullie's age is 9 years old, his height has been specified at 4 feet 6 inches tall. His catch phrases consist of "Jings", "Crivvens" and "Help ma Boab"